"A couldn't-be-easier appetizer that will surely disappear at your next holiday party! Adding the diced red and green bell peppers on top makes it really festive." Sprinkle with mozzarella cheese, covering the shrimp layer as completely as possible. 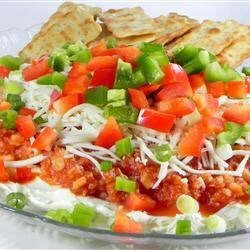 Sprinkle the red and green bell pepper over the cheese layer. Serve with crackers. This was super-simple, and very popular at our Christmas Day celebration. My family really enjoyed it. Simple and yummy! It's one of those things that once you start, you just can't stop eating it... until it's gone! I made this last night for a New Year's Eve party and it was a hit. Some people didn't realize it was shrimp. I liked it a lot and will make again.